Most people assume that celiac disease and gluten sensitivity are the same thing. Fortunately, this archaic thought is rapidly changing. Although it is well established that gluten often impacts the villi of the small intestine, it has also been shown to affect the body in multiple ways. These differences account for the massive failure of doctors to diagnose gluten sensitivity. Below is a diagram of environmental triggers to intestinal permeability (leaky gut). You will find that gluten sensitivity can directly and indirectly contribute to this problem. To the intelligent observer, this picture illustrates why simple antibody testing fails to accurately diagnosis gluten sensitivity. Antibody production is only one lab component of a multi-faceted problem. How Does Gluten Play a Role in All of These Factors? Gluten – Gluten directly impacts the intestinal lining through zonulin production. Zonulin is a protein that directly causes leaky gut. Antibodies – Gluten contributes to the formation antibodies. Antibodies can cause the secretion of inflammatory chemicals leading to tissue damage. Additionally, through a process called molecular mimicry, antibodies can cross react with the tissues of the body causing autoimmune disease. Lab tests measuring these antibodies are typically not associated with gluten because most doctors are not trained adequately to identify the connection. Medications – Many medications commonly contain gluten leading to a direct effect. However, many chronic health conditions caused by gluten sensitivity are misdiagnosed leading to medicine prescriptions that are not only unnecessary, but can be detrimental to the gastrointestinal tract. Anti-acid medications are a common example. These medications predispose to infection and lead to abnormal bacteria presence in the gut. Over utilization of antibiotics to treat viral infection is another example. Stress – Although not a physical stressor, gluten is a chemical stressor on the body. Chemical stress comes in many forms. One of them is vitamin and mineral deficiency. Loss of key nutrients causes a fundamental breakdown in the body’s ability to modulate the healing and repair process. Bacteria – Gluten ingestion causes detrimental changes in intestinal flora (AKA gut dysbiosis) predisposing to infection. This is one of the reasons why so many yogurt companies are adding beneficial bacteria to their products. 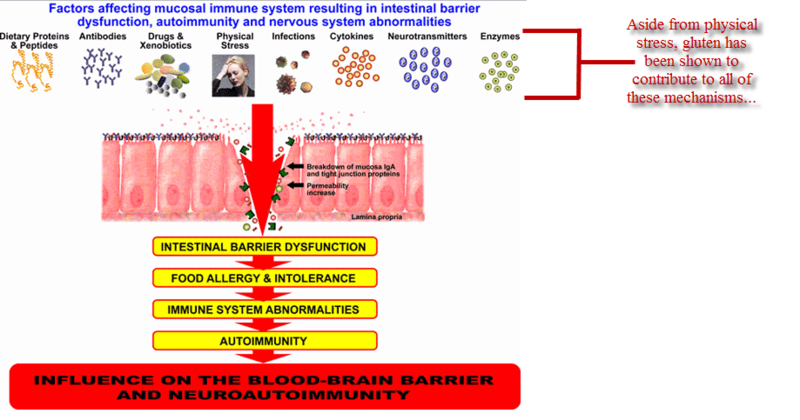 Gut dysbiosisis an epidemic in the U.S.
Cytokines – Gluten induces the production of pro-inflammatory cytokines (chemicals that damage cells). Neurotransmitters – Gluten causes neurochemical changes in the production of neurotransmitters (chemicals that allow the nervous system to communicate). Examples include: serotonin, dopamine, acetylcholine, epinephrine, and histamine. Gluten is also a neurotoxin that has been shown to damage nerve tissue. This is the reason so many with neurological disease (autism, ADD, bipolar, schizophrenia, neuropathy, epilepsy, etc.) do well on a gluten free diet. Digestive chemicals – Gluten can damage the intestine, the pancreas, the liver, and the gall bladder. All of these organs play a pivotal role in the body’s ability to produce digestive chemicals and enzymes. When this mechanism is compromised, digestive processes start to break down and become ineffective. Restoration of intestinal permeability is not difficult. In my experience there are some critical components that need to be addressed. 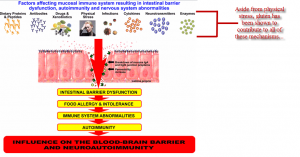 Leaky gut contributes to autoimmune disease. The only known cause for any autoimmune disease is gluten sensitivity. We are blind fools to ignore this connection because it does not fit the status quo of the allopathic medical paradigm. If you have autoimmune disease and have not investigated gluten sensitivity as a contributing factor, you should. Learn more about genetic testing for gluten sensitivity now!